And it finally receives the interior it deserved from day one. We’ve always liked the exterior design of the Jaguar XE sedan and now it looks even better thanks to a mid-life refresh for the upcoming 2020 model year. Jaguar has released official details and plenty of photos of the updated sports sedan which receives some of the attention to the finer details it deserved from the get-go. While the overall shape remains unchanged, the front and rear bumpers have been updated along with the grille, headlights, and taillights. The J-shaped daytime running lights and standard LED headlights and taillights further enhance the new styling. And no, your eyes are not fooling you; the headlights are even thinner than before for a more cat-like angry look. The interior has also been significantly upgraded with a more luxurious look and feel. It’s basically the interior the XE deserved all along. The center console, for example, now features a stacked dual-touchscreen display similar to that in the I-Pace EV, with an optional 10-inch top screen and 12.3-inch driver display. And yes, the rotary shifter is gone, replaced by a more conventional (and welcomed) traditional shift lever. Jaguar is also making available a rearview mirror that utilizes a camera and a high-resolution display to show a wider view of what’s behind the car. Notably, the 2020 XE is the first Jaguar to offer wireless charging. And yes, both Apple CarPlay and Android Auto smartphone connectivity are now standard. The other major changes come under the hood. Instead of the four engines offered on the current XE, there’ll be one for 2020: the 2.0-liter turbocharged four-cylinder with up to 296 hp and 295 lb-ft of torque for the R-Dynamic S trim, or in base trim with 247 hp. Yes, that means both the diesel and V6 are gone. There’s still a chance, however, that the XE will one day receive Jaguar Land Rover’s new twin-turbo inline-six with 395 hp. Fingers crossed. 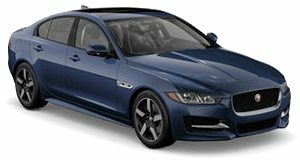 Pricing for the 2020 Jaguar XE S with rear-wheel-drive will begin at $40,895 including destination. Tacking on all-wheel-drive increases that figure to $42,895. The AWD-only XE R-Dynamic S starts at $47,290. Orders for the 2020 Jaguar XE are already underway.